EVS29 Call for Abstracts now open! Electric Mobility Canada invites its members and other Canadian EV stakeholders to submit an abstract to this important event. EVS29 Abstract Submission deadline: October 30, 2015. In September, EMC is organizing chapter meetings in Ontario, Quebec, British Columbia and Nova Scotia during which EVS29 will be discussed. During these chapter meetings, you are invited to share topics of interest you would like to see address at EVS29, If you live in a province where no chapter meeting is held, please contact us directly to share your ideas. 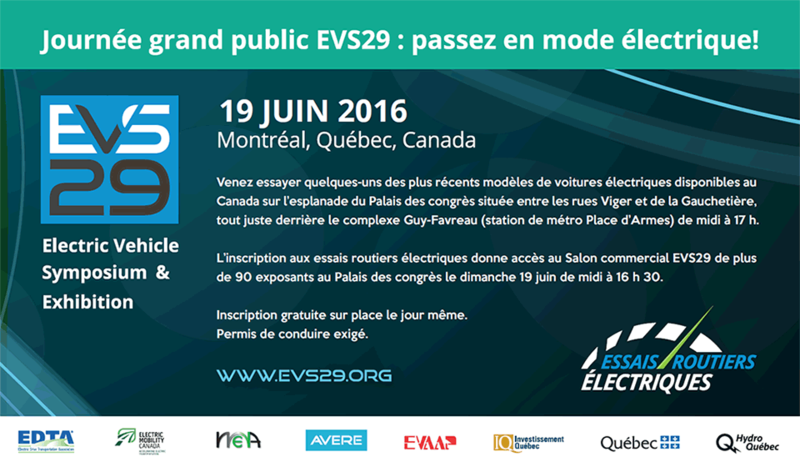 * Please note that the event dates are June 19-22, 2016 contrary to what is indicated on the EVS29 website.